We deal in the Dust Free Hood, which is built to provide the dust-free area for various contamination-sensitive operations like packaging of Pharmaceuticals, chemical processing and others. 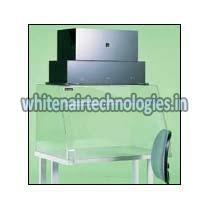 We are banded together with the chief Dust Free Hood Manufacturers and Suppliers from Telangana, India. After quality assurance, we dole out the Dust Free Hood in requisite specifications & quantity at feasible prices. Trust us!